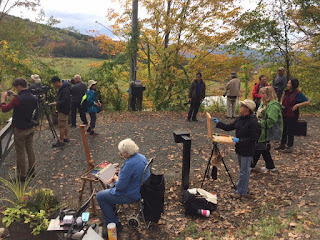 This October my husband, Scott Williams, and I taught a plein air painting and photography workshop in Vermont. Our timing was perfect and fall colors were amazing! 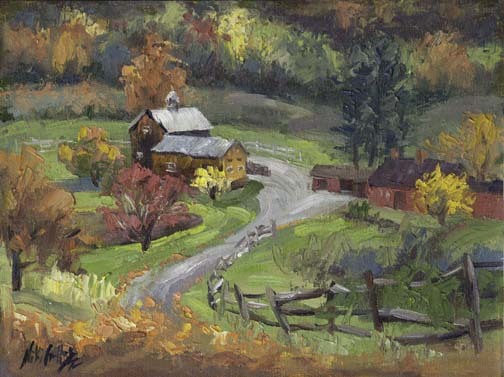 Our first stop was touring the beautiful countryside and farmland around Woodstock. My painters and I set up our easels in front of this picturesque barn set in a valley with an explosion of autumn colors for the background. The photographers shot for a while and then continued on to explore more of the area. We reconvened for lunch and that afternoon sampled local cheeses and maple syrups. Delicious! That night, we enjoyed an amazing farm-to-table dinner at a local restaurant. If you're interested in joining us on one of upcoming Art Treks, please let us know. Spaces fill up quickly!